A recent article states that work published by a chemistry group in The Netherlands “is interesting for origin-of-life research: apparently, you can get these complex molecules before biological evolution has started.”1 They discuss the synthesis of a large molecule which folded into a ring pattern with a five-fold symmetry (pentagon shape) and compared it to the folding of proteins. In the full technical paper,2 most of the discussion and results focus on what was done in the lab and how the resulting products were tested and characterized. The bulk of the paper and the 54 pages of supporting information demonstrate that the structure formed has been well studied by this group. The narrative in the news review article, as well as the original paper’s abstract, introduction, and conclusion makes it evident that they would like to tie this work to evolution and origin of life. Those keywords are used seven times in the brief review, but only a total of six times in the full technical paper, so it is easy to see what part of the paper is being made prominent in the news. Their tie-in is that this large molecule spontaneously formed and folded (in the reaction conditions determined in the lab), which they state, “implies that they [the complex, folded molecules] may have played a role in the origin of life at earlier stages than previously thought possible.” One of the first claims made in the publication is that “complex folded molecules are the product either of evolution or of an elaborate process of design and synthesis.” This is their way of saying that this type of molecule occurs in nature or in the lab, through a series of complex reactions. We can see that their worldview has a role in their assumptions of where complex molecules and proteins came from in nature. The work done in this article is not with proteins, but large molecules that fold like proteins. The folding of proteins is essential to their function.3 It is a complex process to synthesize even relatively short pieces of proteins, called peptides, in a lab setting.4 The arrangement of the amino acids (building blocks of proteins) must be precise. 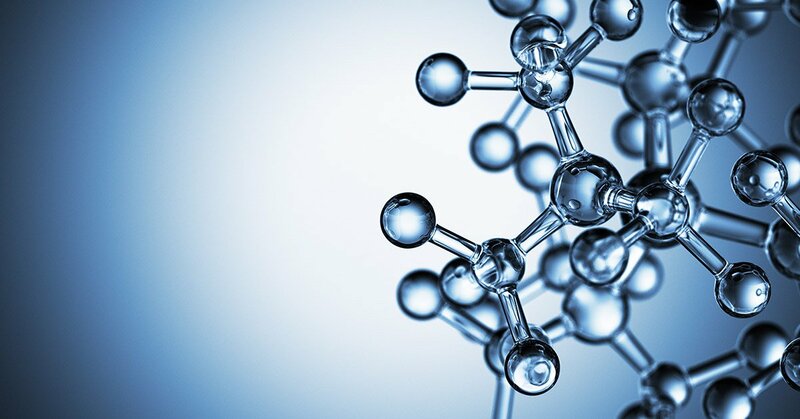 The process of solid-phase peptide synthesis is time-consuming because, in a lab setting, as each amino acid is added it is “protected,” so that the new amino acid will only bind to the previous member of the desired chain rather than making a new chain of its own. The excess is washed away, then a chemical reaction step takes place that cuts off the end portion that was protecting it from uncontrolled chain growth. Now that new amino acid has the protected end cut off, the next one can be added. This process is repeated for every addition. In the end, the whole peptide is released from the “anchor” that it was attached to. The conditions for the overall process often involve harsh solvents for multiple steps, as opposed to the conditions within our cells. The cellular machinery and information in our DNA accomplish what is necessary for our protein synthesis.5 What we, as humans, can synthesize in the lab is impressive, but ultimately is exceedingly limited when compared to what we observe in creation. Proteins and their production, like so many examples in nature, should be a witness to the incredible Designer and Creator of all life. Unfortunately, most of our culture has been taught to view these marvels simply as random chance evolution and that everything has a naturalistic explanation. The large folding molecules in the paper are not proteins, but polymer chain with some similarities in structure to amino acids (building blocks of proteins). These folding polymers are called foldamers by those who do research in this area.6 The research group would like to study the mechanism of the folding to understand more about how these molecules, as well as proteins, fold for their specific functions and purposes. For the synthesis of the molecules in the publication, the reaction conditions and reagents involved caused the product to be formed without extreme temperature, pressure, or harsh solvents. The reactants are the active chemicals in the reaction, the solvent is a liquid environment that allows the reaction to occur, but does not get “used up” and is not a part of the product. Reactions can happen spontaneously,7 in the presence of a catalyst, or when the conditions are appropriate (by controlling temperature, pressure, or the atmosphere, i.e., the absence of oxygen); otherwise the reaction does not move toward the product. Because this reaction proceeds forward, the product is formed, which is why they say the molecules emerge spontaneously, it does not imply that something appeared with no explanation. This product is a large molecule that naturally folds into a five-fold symmetrical stacking ring. The results and discussion of the science done is a detailed account of the methods, concentrations, and buffers (salt solutions) to produce this large folding molecule. As well as many different lab techniques and tests (including X-ray crystallography, chromatography, NMR spectroscopy, and others) which were done to confirm the product and how it folded. The use of these methods is appropriate in the synthesis and characterization of a molecule, but the use of the terms spontaneous, chemical evolution, and even a subheading in Science Daily “Origin of Life” displays the intention of the authors. In much of today’s scientific community, interest is high, and funding may be awarded to proposals that will provide information on evolution and the origin of life. These buzzwords are beneficial for labs to use in their proposals and abstracts of publications. In chemistry, technical papers usually limit the amount of conjecture that can be done within their results and discussion, where data is reported and discussed. However, in the introduction and conclusion, authors usually will add comments about how this information may be useful in a broader sense. If you are starting with an evolutionary worldview, those statements are often found tucked into these areas. Keywords that excite such a large portion of the scientific community can become the focus of the study rather than the work being done and the potential usefulness of the product. In this research, the real story should have focused on the novel method that this large, stable molecule formed and folded as they have reported. The size and shape of any given molecule have many implications in its usefulness as a catalyst, a chemical sensor, a scaffold for further reactions, or for its medicinal applications. This was a synthesis and characterization study, meaning the researchers made a product and studied its structure extensively. They have not reported on any applications, but the further study of its activity in any of the areas mentioned above is the exciting potential of research. Complex reactions can be accomplished if conditions are suitable. Complex molecules can be synthesized in the lab from very simple molecules. Total organic synthesis of natural compounds is often done to replicate something found in nature that has a positive, often medicinal, role to play.8 But the odds of every component of cells with their complex organelle “machinery” coming into place by natural means are absurd. But even if that were to have happened, life does not come from any amount of chemical reactions producing even the most complicated systems. Chemistry is essential in all aspects of life. Reactions are happening around us, and within us all the time, they generally are either one directional or they form an equilibrium. A reaction that goes in one direction will continue until one reagent is no longer available. A reaction that forms an equilibrium finds a balance of both products and reactants present; if it is then disturbed, it will return to the original or find a new equilibrium. When these reactions are taking place within a living system, we may even refer to them in different terms than when it is happening in the lab. The same chemical reaction may occur in the lab or in a cell, and depending on what the reagents are and where it is taking place, we call it inorganic chemistry, organic chemistry, or biochemistry. However, no amount of chemistry has ever produced or breathed life into any cell (Genesis 2:7). Chemistry alone cannot create a plant, animal—or certainly not a human who has been given a soul by our Creator as we were made in his image (Genesis 1:26). Each field of science needs to include a certain amount of imagination, wonder, and desire to solve a puzzle. Science is asking questions, studying, and observing our surroundings. Designing experiments to try new techniques or variations on established reactions is how we find answers and make new discoveries. The questions asked should be testable and claims made should be relating to what is observable and repeatable. When claims are made about the origin of life, they have stepped beyond what can be tested. Being a researcher is often being a problem solver, but there is an element of story-telling when presenting one’s work. This is especially true when an author switches from discussing what has to what has not been observed in the lab. My first reaction was that there is no place for storytelling in science, but as I thought on it further, I realized that it is not inherently wrong to do so. In addition to having the skill of presenting their work in a readable manner, there are two circumstances where a researcher may comment on what is unobserved concerning the findings being published. If what has been projected or extrapolated is something that has not yet been accomplished, but could be, then experiments can be designed to study that question. Then those thought-provoking questions and conjectures may lead to further discoveries. However, science often gets the credit for explaining the past as well, where we came from, and how the world began. If the discussion pertains to a non-observable, non-repeatable, non-testable past, then, as Christians, our job is to discern and filter through the material and recognize what reliable science has been or could be done on the findings and what is interpreted through on the author’s worldview (1 Thessalonians 5:21). The study of chemistry can often be done without reaching into unobservable historical science. Operational science in chemistry is what we can observe, study, and repeat. Once a reaction mechanism is understood, given the right conditions, it is expected to work repeatedly. The nature of God is unchanging (Hebrews 13:8), and many of his attributes are reflected in his creation (Romans 1:20). Think of the chemistry that is happening outside of the lab every day in our world and in each living cell: the repeatable nature of chemical reactions is one of the many ways that His creation gives glory to His name. The technical paper simply reports that a molecule was made, when that molecule was mixed in a higher concentration the foldamer was formed and was found to be a very stable molecule. The research group performed a number of chemical analyses to confirm the characteristics, composition, and conformation of the molecule. This information can answer questions about the hydrophobic/hydrophilic portions of the molecule, how many unit groups make up the larger ring (15), where particular folds occur. These questions and others are addressed in the paper and supporting details. When a new molecule or class of molecules is synthesized, or a new method is developed, it is proper to study it, characterize it, and publish what has been found. That is the first step. The researchers may even have an idea of how it could be used or what its functions may reveal in further study. This has not yet been done with this study. The language with which they present their work has certainly caught the eye of many. Remember, when a reaction occurs without a catalyst (i.e., an enzyme in biochemistry) it is said to be spontaneous. This is part of the language of chemistry, it does not mean that something occurred for which there is no explanation. They have asserted that this work relates to the origin of life. However, no experimental design will be able to accomplish what they hope to prove, and the research published has not provided any evidence for evolution.